I have been involved with NLP (neurolinguistic programming) for more than ten years, and have been training NLP for almost that long. In that time, I have used NLP as a window into developments in the evolution of coaching and the discoveries of neuroscience. I have developed long-term relationships with clients who return to me for training because they find that my teaching is both powerful and practical. There are many, many things I love about neurolinguistic programming and the gifts it has given me in a decade. This week, I have listened to smart well-trained coaches who believe that any sustainable change takes at least three months, and to another smart, well-trained coach/therapist who says that research shows 3-10 sessions is the optimal length for helping someone make a desired change. Both camps insist that they get results for their clients, although the expert in brief interventions did not claim to get results for everyone. She claimed that it is only possible to get results from people who are ready to change. Both camps claim to be client-focused (which is to say that they claim the client is the expert on his/her own life), although the longer camp seems willing to be more "directive." How is it possible that both camps are telling the truth? Because the problem for someone who wants to change is that both camps are telling the truth, from a certain point of view. I recently gathered some of my best friends and closest associates and asked them to bring as a gift a story of persistence. Persistence is not one of the sexier virtues, and it's one of the hardest to define. What's the difference between doing the same thing and expecting a different result (insanity!) and sticking to your plan long enough for it to work? Are you crazy if you keep hoping for something that isn't happening or are you unfocused if you abandon your goal because you don't get instant success? It's Friday afternoon and you're looking back at a week of work. What did you accomplish this week? If it feels like nothing, look again. You did make progress and if you don't notice it, you will probably lose it. So if something is better now than it was on Monday, it's a good time to pay attention. Paying attention to progress helps stabilize it in your mind so that it becomes part of the assumptions you take into Monday morning. It's often not enough to prevent slippage. What you need is to add a little oomph to progress so that it stays in place until you can get back to it. Here's three ways to add oomph to your progress, illustrated with examples from my own week. What difference does it make if work is just a little bit fun? Logically, fun is a distraction and there's no particular reason that a day with a little fun in it would be more productive than a day of focused, serious work. Practically, we all know that we're more likely to be productive if we're having a little fun mingled into our task focus. How does that work exactly? First, it helps us remember that people are not computers and they don't work the way computers do. Our thinking is a complex weaving of reason and memory and sensory awareness and emotion. Fun can involve three of those, and that means that it's actually quite a rich form of thinking. A little fun is likely to be using a lot of your brain, and that wakes up more resources for applying to your work. Have you ever had a day when what you wanted most was to laugh? It sometimes happens that thinking through problems and solutions is overwhelming and grinding out work is exhausting and the only real solution is to laugh. This is hard for introverts, since we laugh more easily in the company of others (we all know that laugh tracks work because the quickest way to get someone to laugh is to laugh yourself). Several times a week, I spend time with my laughter coach. She does not charge by the hour, but she does value obedience and full engagement. My coach is my 18 month old niece. She is a giggle expert, but she has also mastered the grin and the chuckle and the bemused half smile that indicates she can sometimes suffer fools with good humour. Influence is not always fun. Supportive influence is not always fun. If you want to communicate in a way that gets results, it will feel good overall. It might not feel good all the time. Let's take coaching as an instance of supportive influence that can be tough on your sense of yourself and your beliefs about the world. This is not the popular view: visit any of the coaching associations or training advertisements and you won't find this caveat: This activity may break your heart or your spirit. Caution is encouraged. Nope. Instead you find definitions about 'partnering' and language around 'empowering.' Yes and. Coaches training should ask: Do you know how to develop a strong heart, a strong head, and a strong stomach? One of my favourite high school teachers used to say "We grow through pain." I didn't buy it then, and I don't buy it now. I look at small children and small plants. They are wonderful examples of growth. And no sane person believes that pain makes them grow faster or better. It's the sunshine the brings out the crocuses, not the ice storms. I think we all want to believe that pain causes growth because it makes sense of pain. Since we all experience pain, it's rather nice to think that we gain something from the experience. We are even motivated to make that seem true, motivated to turn our thoughts or our actions in a new direction after pain. One of the most effective tips I have learned after decades in post-secondary teaching and adult education is this: encourage people to applaud for one another. The form of the applause will change depending on the situation, but the effectiveness of applause will be constant across different ages and different circumstances. Applause is contagious. What happens when people clap? It doesn't take long before they begin to smile. And not long after that, they begin to suspect that there's something worth applauding. This is true whether they offer genuine applause or whether they applaud because the leader tells them it is required. I have watched many different people under the influence of applause. Most of them look embarrassed, at first. They look like they are not sure that the applause is really for them. This became a refrain in our house when my kids were young. I'd say: do you want to go to the park or to the library or watch Star Wars? They'd say "Don't make us choose. There are too many fun things to do." Yes, it is a first world problem. We don't worry about having too many good choices when we are sick or stuck or broke. We worry about just one thing. But first world problems are problems too. In some ways, they are the most interesting problems. In the exhibit Massive Change, Bruce Mau asked the question "Now that we can do anything, what will we do?" We often talk about passion as though it inevitably flares up and disappears. I wonder if passion is really fleeting. While romance certainly changes over time, there are other things that inspire passion in us. Yesterday I had coffee with friends from my days as an undergraduate at Trent University. We last saw each other thirty years ago. (Yes - thirty years. It freaked all of us out a little). The meeting happened because we connected on Linked In. It was a case of social media doing actual good. "The ICF defines coaching as partnering with clients in a thought-provoking and creative process that inspires them to maximize their personal and professional potential." Coaches talk people into thinking and behaving in ways that they wouldn't think or behave on their own. Their process is always about communicating through language and relationship so that their clients make changes in what they think and accept the task of changing what they do. This doesn't mean that coaches tell people what to do. The "partnering" in the ICF definition is meant to walk the fine line between having no influence and having too much. How can you lead a conversation so that your clients discover their own best approach to their problems or goals? The best way is to DARE: to use a simple four step process that maximizes the effectiveness of the coaching relationship while minimizing the danger of undue influence and the resistance which accompanies that danger. Often often do you catch yourself wishing you could change something about you? It can be easier to wish for change than to do the work to make it real, whether that change is personal (weight loss, addiction, or bad emotional habits) or professional (time management, diplomacy or confidence). We often know what we need but feel like it's unreachable. The change you want will be unreachable until you reach for it. And then you need a process that will help you manage your will power and persistence until the change becomes natural. There is no road to intentional success that does not require some hard work and discipline. But the FACT process will allow you to be more effective with less suffering and no room for the self-loathing that sometimes accompanies failed efforts at personal change. Does it happen in your work? There are many different reasons for ending up with a pile of work that bores you. It's a chore that needs to be done and you have to get through it before you can get back to doing something that engages your full attention and feels productive. There's lots of advice on how to tackle the mountain, from taking frequent breaks, to stressing out (a little stress is productive when the task doesn't require inventive thinking) to delegating the work to someone who will love it (there are some jobs no one loves). Over my years as a teacher facing a mountain of marking, I have tried most of the advice. It has all left me convinced that sometimes a chore requires a little mental toughness and a lot of persistence. There's a kind of rule that people stop having bodies when they get to work, at least in jobs that do not involve obvious physical labour. To be professional is to stick to ideas and tasks and objectives. That means that while we may ask "how are you?" we really mean something like "of course you are fine because you are at work." We mean this although we all have experience of the difference between working when we feel well and working when we are in pain. How do you feel when you think about police officers, fully armed and allowed to drive, on patrol while suffering from migraine, back pain or sleep deprivation? What about when you think of your doctor or nurse making decisions or giving medication while distracted by pain? Perhaps the person marking your child's exam is suffering from a repetitive strain injury or nerve problem. This is my challenge this week. A young friend is grieving one of those unexpected, brutally unfair deaths. I know that such deaths make us all feel inadequate and that there is always huge guilt, and I want to say to this young friend: you will survive this feeling of guilt. You will survive this feeling that you didn't say the right things, didn't do the right things, didn't pay attention to the right things. You will have this huge, gaping wound inside of you and you will make it through to tomorrow, and the next day. There are no words to say these things. The words I wrote above will connect with you because we are not talking about you. They will connect because you can see from a distance that such things might be true, especially of someone else. They will not connect with my friend because my friend is living them. And words are slippery things when they are trying to connect with the core of your life. There's a truism that says you are more likely to hit something if you are aiming at it. We say things like "keep your eyes on the prize" and mean that paying attention to your outcome is likely to give you both a strategic advantage and the willpower to persist until you achieve what you want. We say these things because they represent a hard lesson. Take, for instance, a desire to be better spoken, to be able to talk in a way that impresses people more favourably. Most people try out new words or model great speakers in a concentrated effort to improve their choice of words. Ironically, their very first steps take their eyes off the prize. 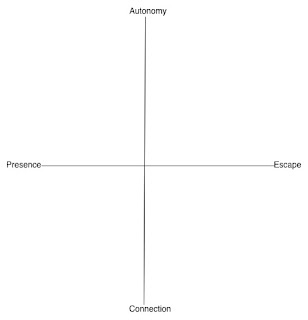 I'm going to suggest that there are four things that everyone wants, and that you can chart them on a quadrant. The first axis has autonomy (control over one's own life) at one extreme and relationship (connections with other people) at the other. The second axis has living comfortably with one's body at one extreme and escaping the confines of one's body at the other. Everything that people want falls into one or more of the quadrants. It seems that anything we want serves one quadrant at the expense of the others. If we want autonomy for our bodies (perhaps the ability to support ourselves financially), that comes at the expense of escaping the body through connection with others (perhaps through reading fiction). If we want to be physically connected (to hang out with people we like), that comes at the expense of setting our thoughts free. It's obvious that we cannot simultaneous move to both ends of the axis.